You are here: Home / General Discussion / Churn to Spurn! 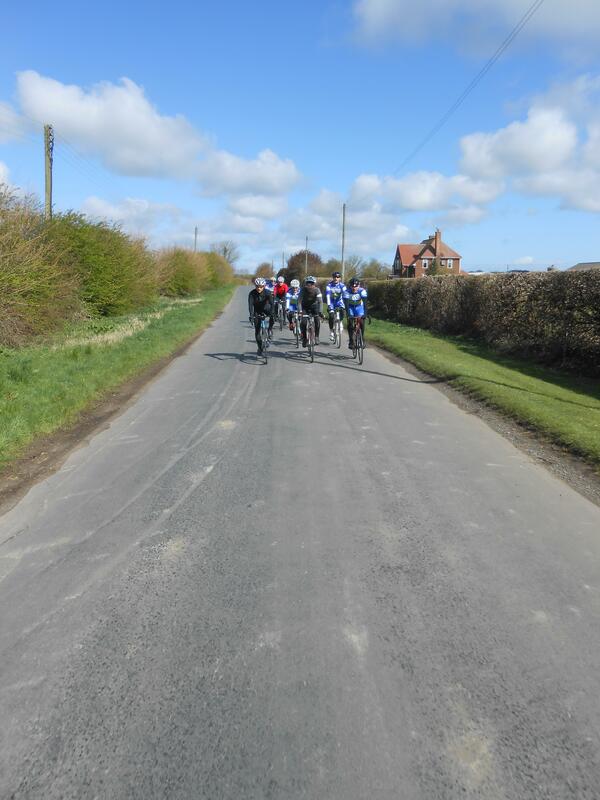 The 17th April marked the first away day for the Beverley Knights Cycling Club. 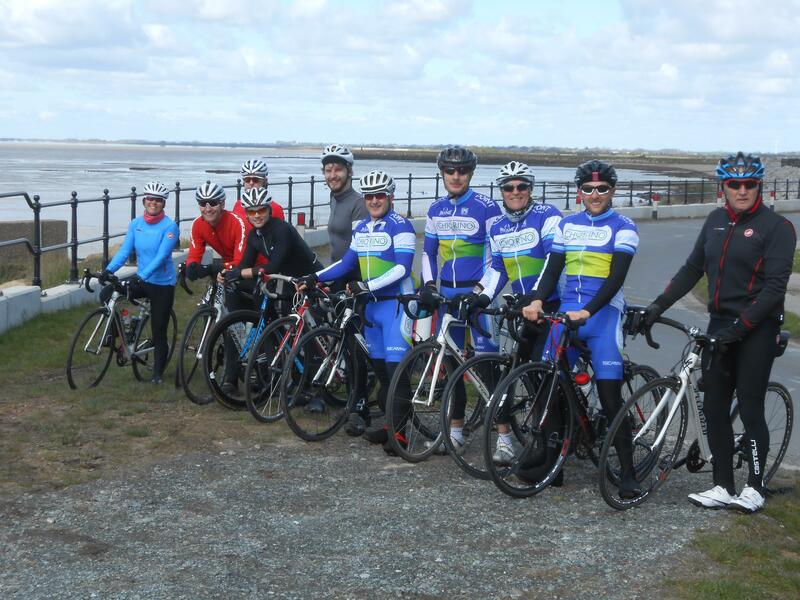 The chosen destination was Spurn Point with a wonderfully flat 82 mile loop. The weather gods gave us their blessing and although it was chilly the sun was shining with hardly a cloud in site! As is customary with Sunday Club Rides we met at 9am (slightly earlier than normal time 9.30am) at the market cross in Beverley Town Centre. A group of 10 rolled into town centre ready for a day of riding. Usual club rules applied ‘twenties (mph) plenty’ and off we went.’Hang on! Wheres Mike?’ A quick detour to pick up a sleepy Mike from his house who thought the usual time of 9.30am applied (we’ve all been there). Heading out the back towards the village of Tickton it felt great to be back on the away days after a long cold winter, you could almost get a sniff of summer coming! Despite the use of GPS the good trusty map was called in to action somewhere just outside of Sproatley. 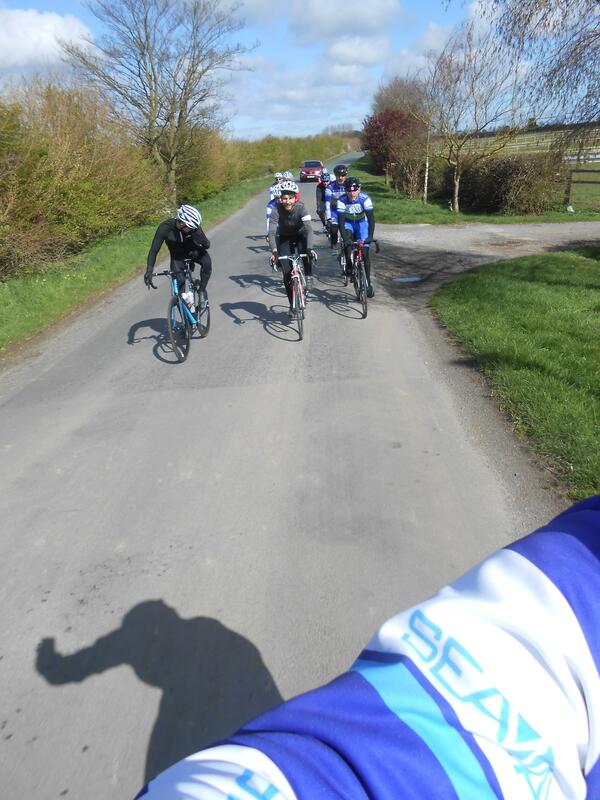 Thanks to James & Neil for planning the route, the effort that goes in to planning the rides is often underestimated so thanks to all involved week in week out. 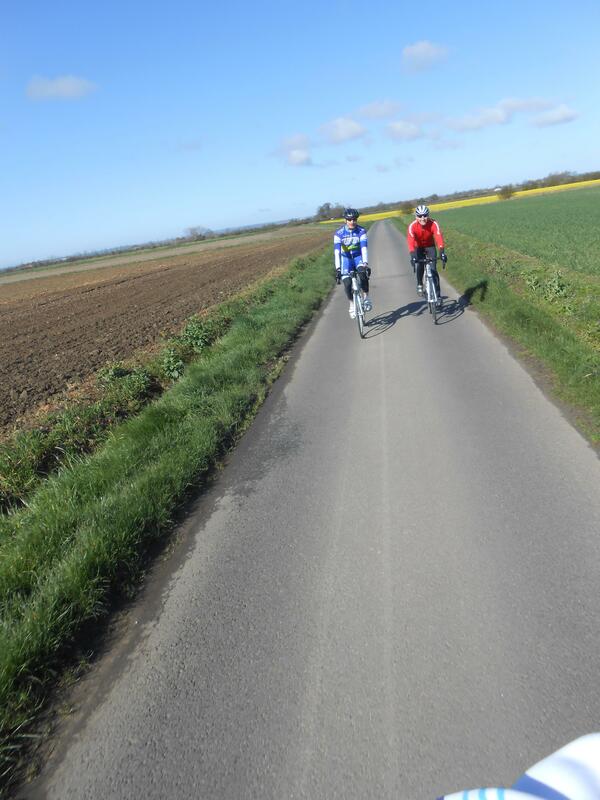 A quick check from navigator Neil and we were back rolling along in the sun . As we rolled in to Spurn a welcome site of the Crown & Anchor pub awaited us. When we pulled in to the car park – disaster! A closed sign on the door. We faced the option of waiting half an hour or finding a cafe, luckily the Spurn Yorkshire Wildlife Trust Cafe came to the rescue with the recognisable face of my old school teacher running the Cafe (many hours spent in detention so kept my head down and got my coffee order in). Some top grub, good coffee and highly recommended. 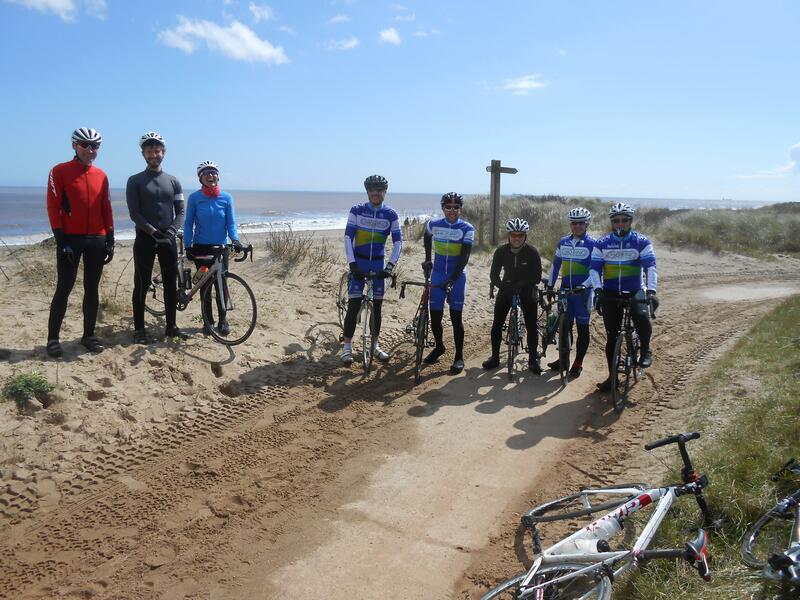 For the CX riders amongst us an attempt was made to ride to the end of Spurn Point itself however the water and sand was not a combination to be messed with so that attempt unfortunately was unsuccessful. Another group photo and we were on our way. 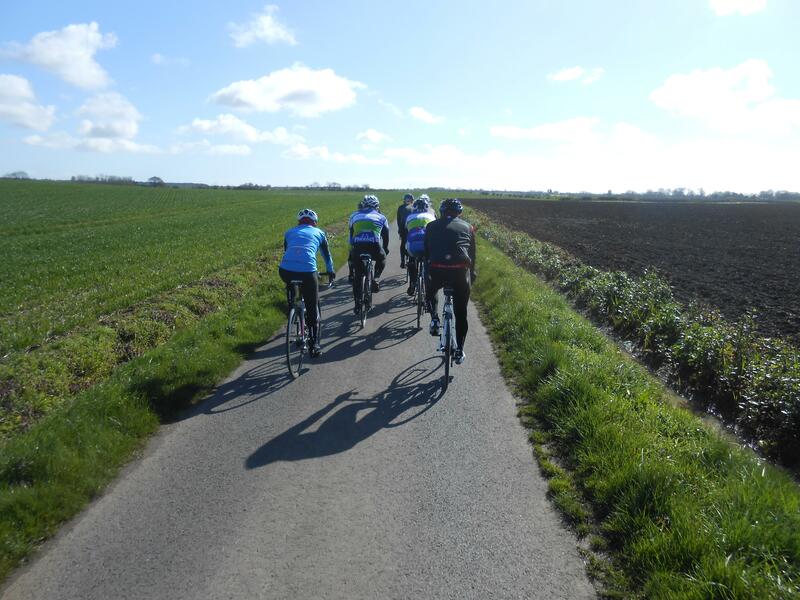 The way pack was tough in places and at times pacey (apologies on behalf of myself and Stephen O) with a severe head wind and some busy main roads to navigate we managed to regroup nearer to Leven and roll back to Tickton. All in all a fantastic ride out and look forward to many more this year. Some photos of the day are attached. Look closely at the water behind in a couple of the pictures and see if you can spot a spooky cloaked lady…..